I'm not sure a museum is the best place for anything Top Gear-related. An institution perhaps? Or a zoo? 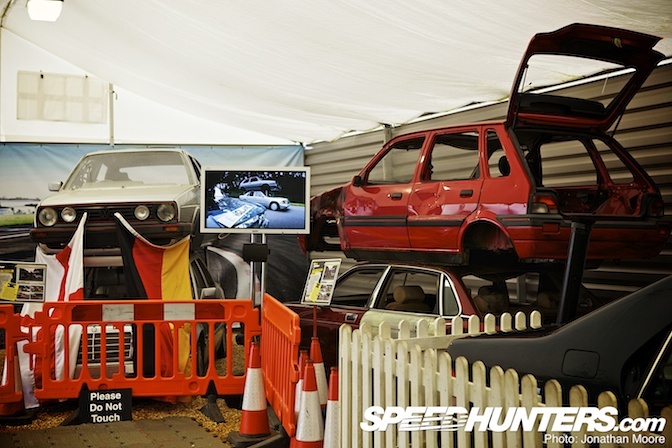 But anyway, Top Gear have an area staked out in the vicinity of the main hall of the National Motor Museum at Beaulieu (pronounced 'Bewlay', by the way). 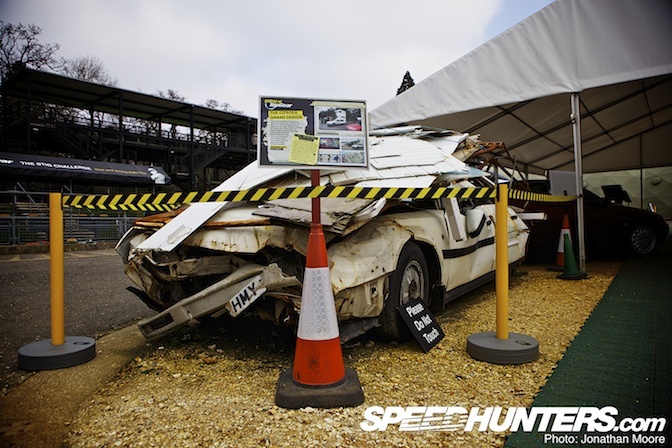 Here is displayed – or as it's Top Gear we're talking about, dumped may be a more appropriate term – a swathe of cars that have been subjected to the Clarkson & Co treatment over the years. 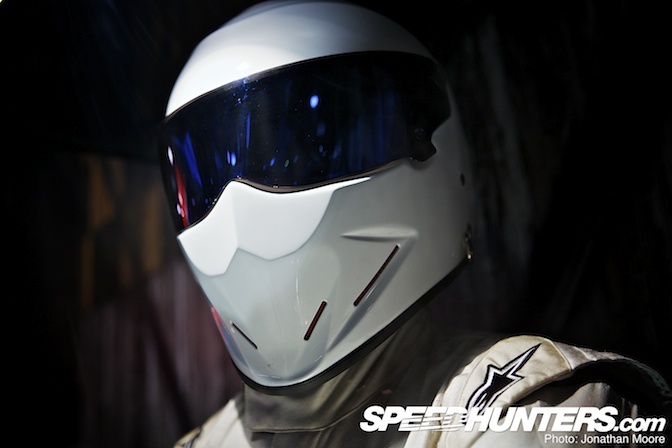 Part racing driver, part myth: all we know is that he's called… The Stig. When not on duty filming for Top Gear, the actual Stig stands guard in the main exhibition control room, keeping an eerily immobile watch on the exhibits. He doesn't say much, but then again… he never did. 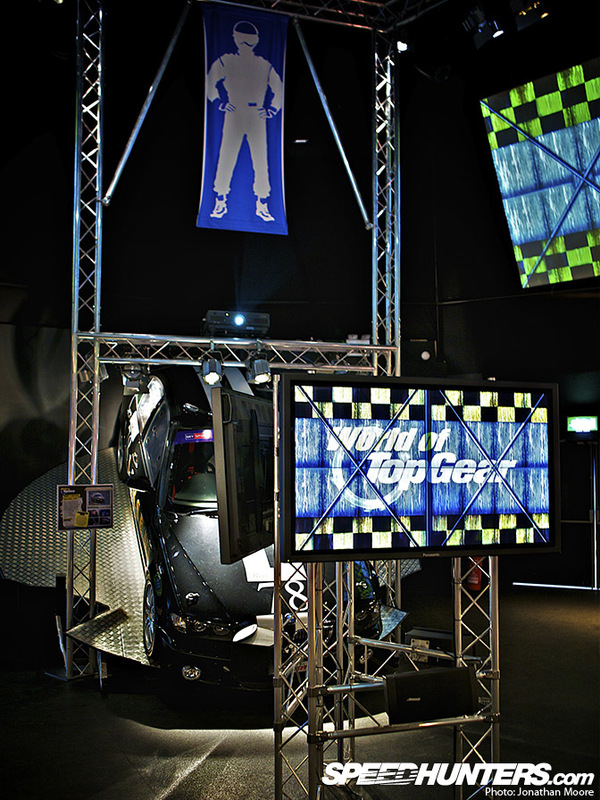 The Top Gear exhibition at Beaulieu reminds me of the droid torture chamber in Empire Strikes Back. 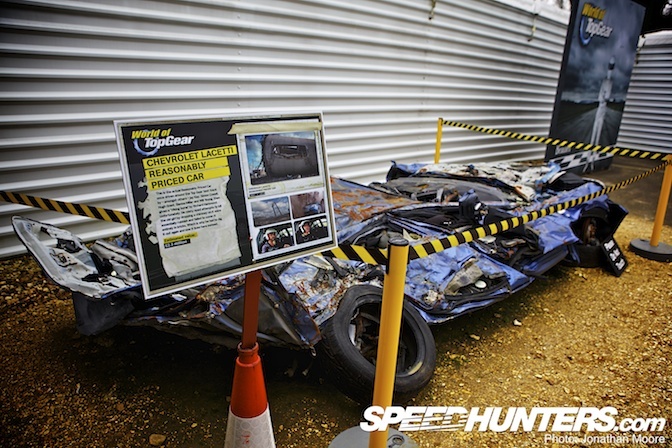 Rows of disfigured metal, the results of twisted experiments, litter the Top Gear display, each one bringing back memories of another insane challenge that the team have taken on. Following the original version of the series that ran in the UK in the '70s as a conventional car review show, Top Gear was rebooted in 2002 as a quirky magazine-style show fronted by Jeremy Clarkson, James May and Richard Hammond that is now estimated to having over 350 million viewers across 170 countries. Sometimes I think Top Gear is an anathema to anyone who loves cars. They drown them. Fire them into the sky. Chop them in half. Drive them into each other in hilarious clown stunts. Clarkson in particular is the target of constant criticism in the UK for his outrageous, opinionated ranting both during the show and in his various other media outlets. Yet – and maybe because of its refusal to toe the line – Top Gear is undeniably compulsive entertainment for petrolheads. It might be heavily scripted, it might be offensive, but it's hilariously entertaining. It's the show I love to hate and hate to love. 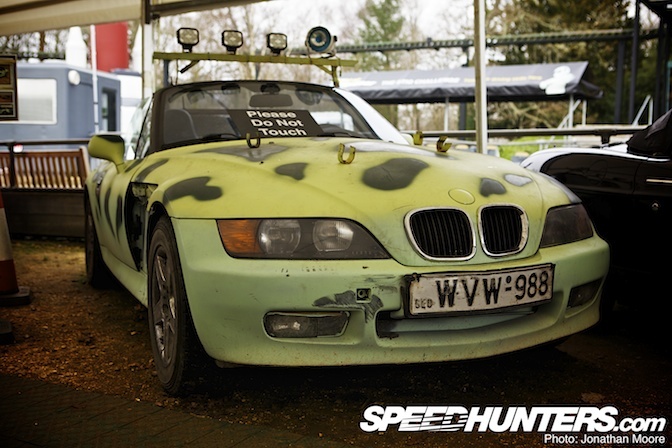 May's mount was a recalitrant BMW Z3 painted in an Afrika Korps-style desert warfare scheme. The starting point was in Iraq: the three cars were driven off a huge Russian transport plane onto straight into a hot LZ. It seemed like an insane idea: each of the presenters was issued with a flak jacket and an armed guard was with them for the entire journey. With a Vauxhall Astra always lurking in the background as a back-up car should any of them fail, the three ploughed on through hostile towns and across deserts – during which May suffered concussion and had to be taken to hospital. On their eventual arrival in Bethlehem, they discovered… a new Baby Stig. 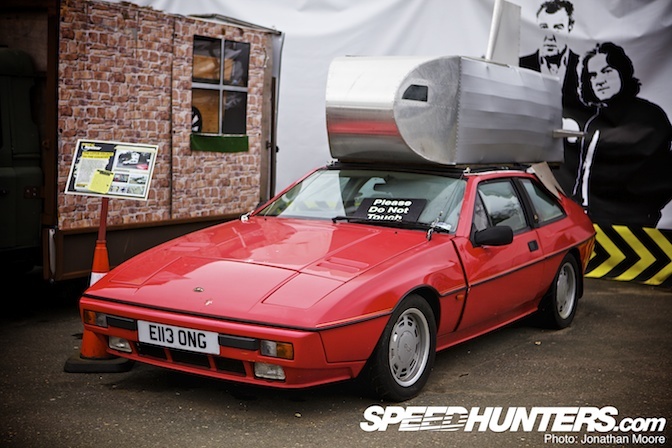 High on the list of things that Top Gear don't like are caravans. 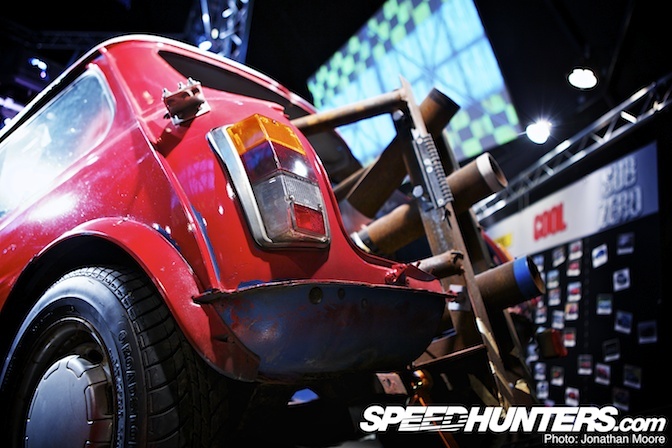 And then there's the Reliant Robin. Of course, the crew thought the best use for it would be to launch it into space. 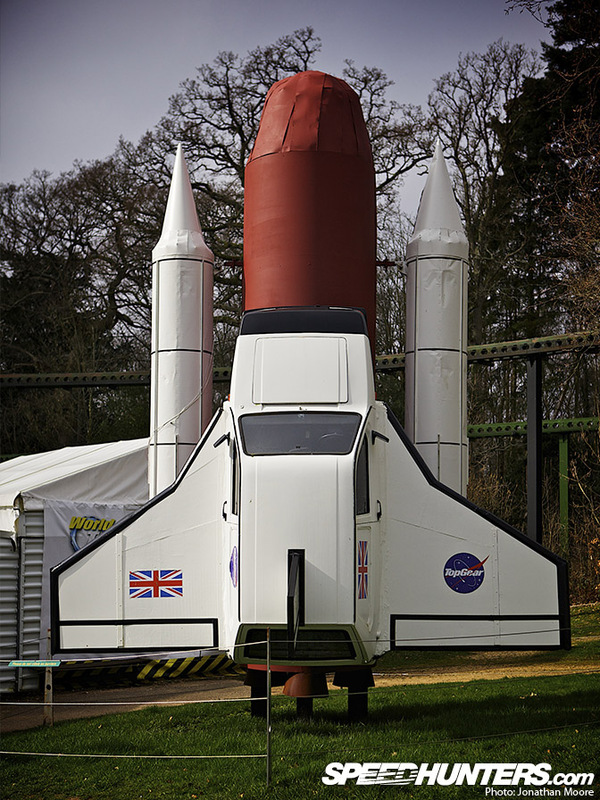 They failed, spectacularly, but somehow the Reliant survived and the pinnacle of British space exploration is now on proud display at Beaulieu. Another must-see sketch, where a rocket-powered Mini with a tonne and a half of explosive thrust was fired down the Olympic Ski Jump at Lillehammer, Norway, to see if it could out-jump an athlete on skis. It couldn't. Having destroyed several Toyotas during a football 'game', the team turned their destructive attention to Canada's favourite form of warfare: ice hockey. This is what's left of one of the participating Swifts. In another attempt to rid the world of caravans, the team's challenge was to make motorhomes that were both compact and cool. The motorhome had to feature somewhere to sleep, somewhere to eat and, most worryingly, somewhere to go to the toilet. The Lotus Excel Escape To The Country was May's contribution. Hammond's Land Rover 110 carried a flat-pack set of 'walls' to construct a flimsy extension; Clarkson's Citroen CX Grand Design featured a three-storey construction and minimalist modernity. Until the other two pushed it off a cliff. 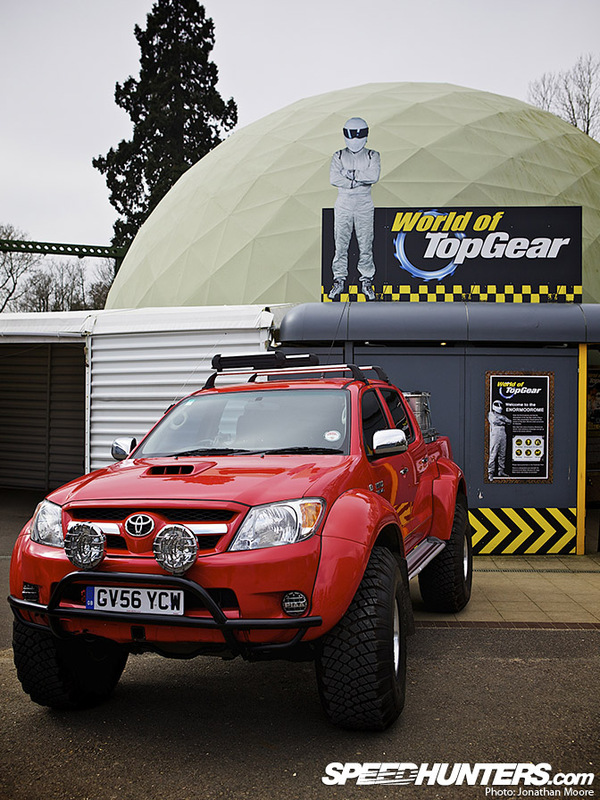 Top Gear have a grudging respect for the Toyota Hilux, as variants have survived everything they can throw at it: being floated out to sea, set on fire, and finally being placed on top of a high-rise tower which was then destroyed in a controlled demolition. In the latter challenge, it was still able to be driven away… This 2006 3-litre Toyota Hilux was modified with 38" studded snow tyres, extended wheel races, heaters, a 90-litre auxiliary fuel tank, ultra-low gear ratios and two winches for a journey to find the magnetic North Pole. James May reused a second Hilux originally used by the film crew for his later attempt to get close to the still-erupting Eyjafjallajökull volcano in Iceland. The vehicle was further modified to include a tyre cooling system using environmentally-friendly vodka in place of anti-freeze and a corrugated roof to prevent damage to the vehicle from volcanic debris. 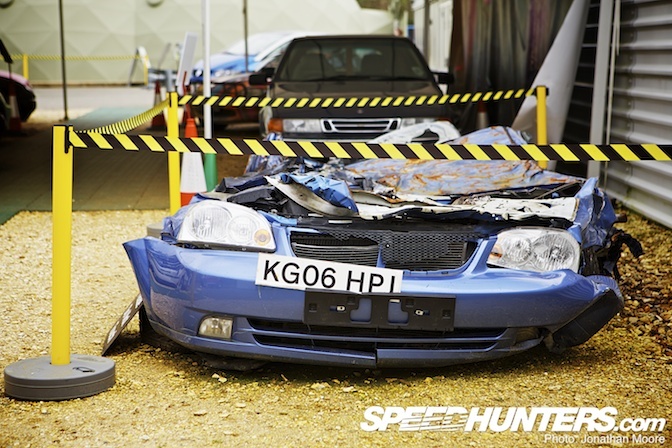 The second Reasonably Priced Car on Top Gear, this model was sentenced to death by crushing. It was put inside an old industrial chimney, which was then demolished around it. The Lacetti suffered some serious remodelling. The uncharitable would say it was an improvement. Top Gear England V To pGear Germany. Car on top of car, with the bottom driver controlling gears, brakes and accelerator and the top driver steering. Of a fashion. The fact that Clarkson's co-driver's false arm came off during the race didn't help matters. In this episode an Espace was 'expertly' turned into a drop-top. I quote: "Their lateral thinking, backed up by solid engineering know-how and almost no lacerations to their hands, proved to be such a success in key areas such as high speed integrity and resistance to monkey attack that it is believed that all but two of the world's major car manufactures are currently investigating ways to avoid making a vehicle exactly like this." The Espace's humiliation can now be enjoyed by the general public. 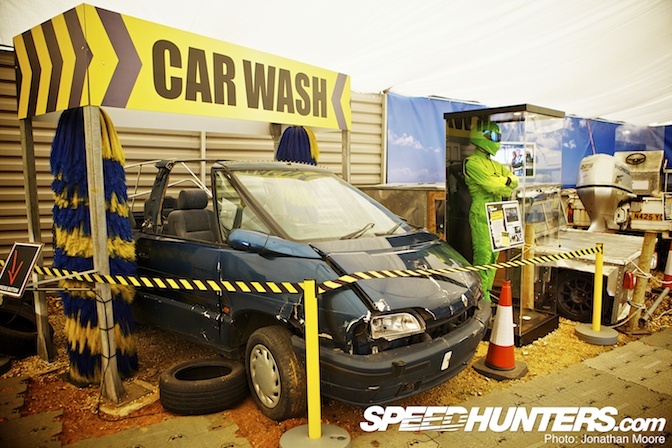 Press the button and the car wash starts spinning, spraying the MPV with a desultory splash of water. It's most inhumane. Or 'How Not To Turn Up To An Awards Ceremony'. A Fiat Panda, MG-F, Alfa Romeo 164 and Saab 9000 were mercilessly butchered in the name of Top Gear-style entertainment and stretched out to unfeasible lengths with mixed success and, most important of all, rigidity. Clarkson did at least make it to London's Brit Awards with his assigned celebrity – though only with the front half of his Panda. 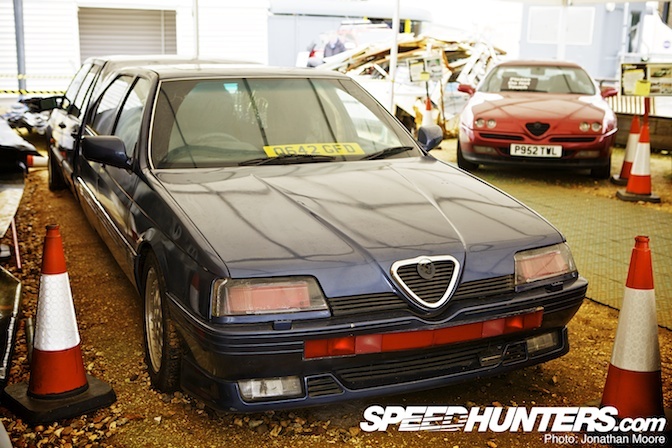 The Alfa limo was also a Saab 9000. The cars had been torn in half and crudely welded together to make the abominable Salfa Romeaab. Here you can also see a dear (to me) old GTV, part of TG's Cheap Car Challenge of buying sub-thousand pound Alfa Romeos (not a difficult thing to do these days, it pains me to say). The pay-off line declaring Alfa love just wasn't enough to make up for the 20 minutes of Alfisti torture. The horror! 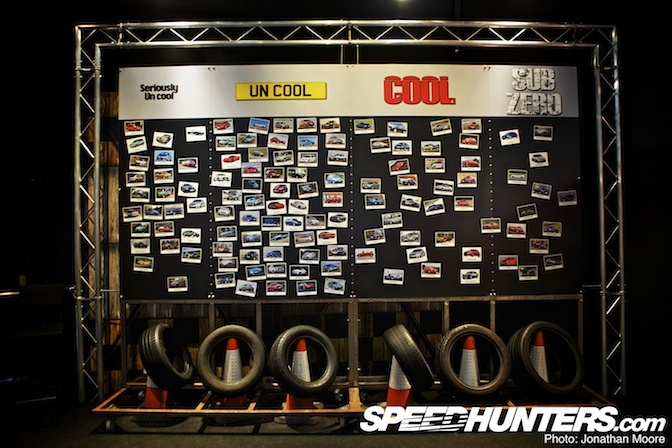 The main permanent 'Enormodome' houses a mock-up mini Top Gear studio with a reconstruction of the Cool Wall. 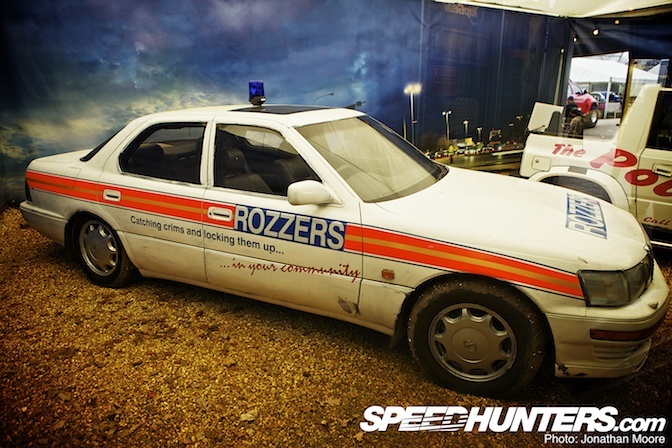 In an effort to spice up the boring rep-mobiles forced upon the poor British police force, Top Gear built up some alternatives. For £1,000. 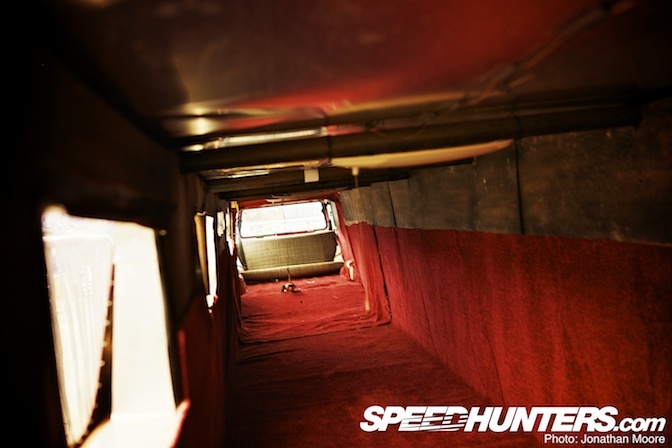 A Fiat Coupé 20v Turbo, Lexus LS400 and Suzuki Vitara were 'brought up to Police spec'. 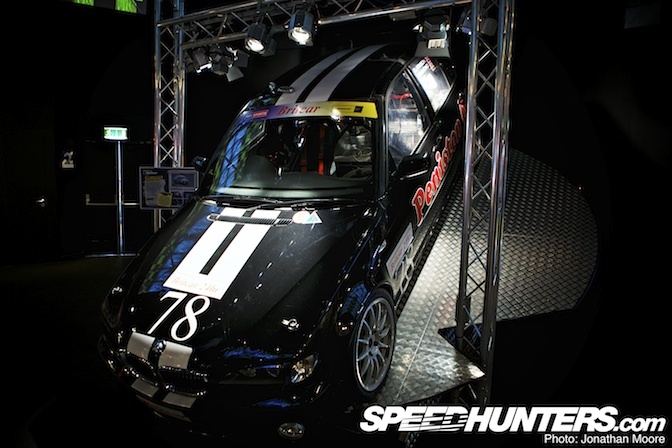 Clarkson fitted his Fiat with knives on the wheels and painted it in an Italian Polizia Di Stato livery. 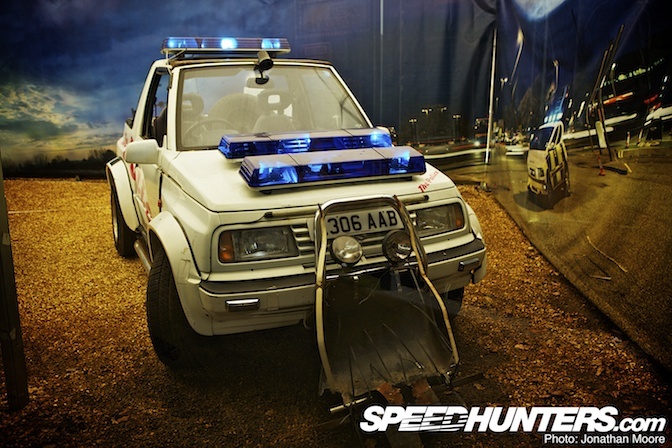 Hammond's Vitara had an overload of lights and sirens, plus a self-deploying 'stinger' on the front. 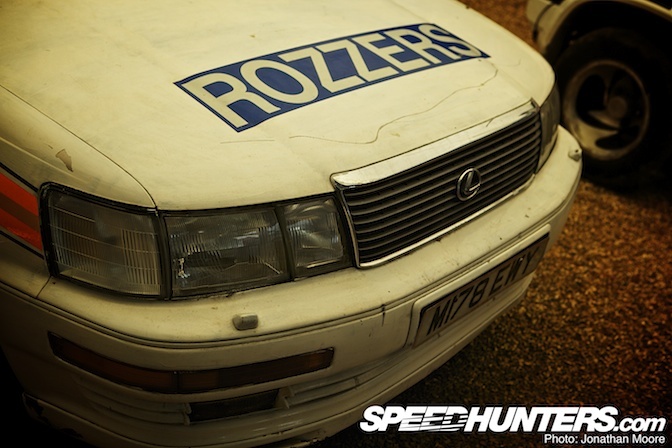 James May's Lexus used a classic 'jam sandwich' livery used in the UK in the '70s and '80s: the siren from an ice cream van was complemented by paint sprayers front and rear. All the cars of course failed the Police tests they were set. 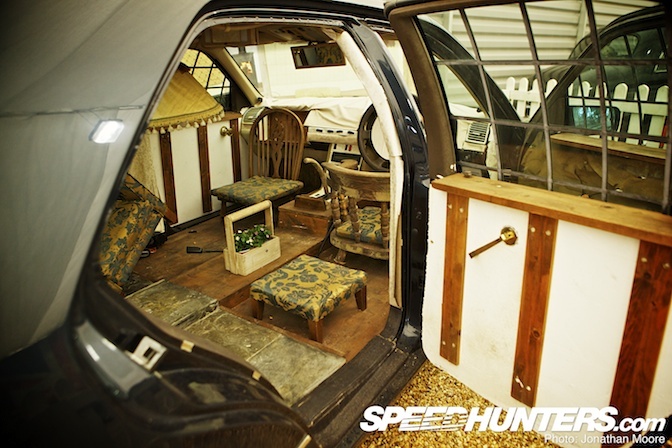 Bored of the fake wood and chintzy interiors of executive saloons, Clarkson took up the challenge of converting a Mercedes S Class into a… mobile cottage. His reinvention of luxury car interiors saw the addition of flagstones, a wood burner, two tonnes of cement and armchairs. It could barely move, and the unsecured chairs led to predictable results once the car did get going. 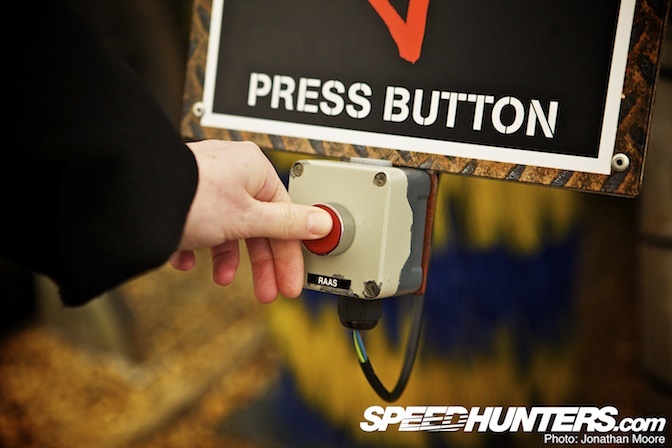 Sensibly, Clarkson left it to May and Hammond to test. 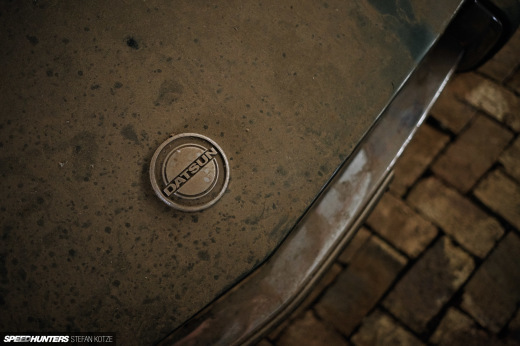 Did the epically doomed British Leyland firm ever make a good car? 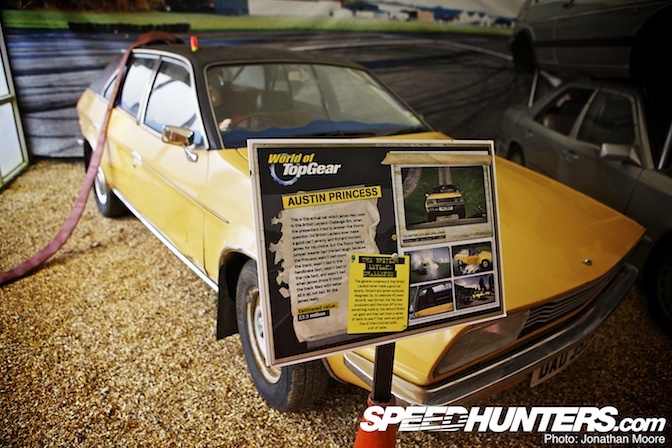 James May set out to prove that – unfeasibly – the mighty Austin Princess was just the example he needed to show that they did. 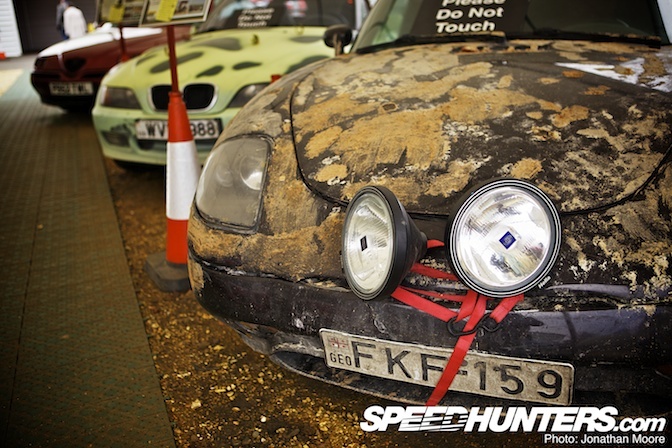 It 'wasn't bad' round the track, 'wasn't bad' in the handbrake test or ride test. It even 'wasn't bad' when it was driven round the track whilst filled with water. The jury is still out. As you'd expect, this is no static display: as the crumpled remains of previous Clarkson experiments rust away, new witnesses to his cruelty are added. Since my visit the TGV12 'sports train' and Snowbine have been added, so it's one of those places that you can happily revisit – like the National Motor Museum itself. 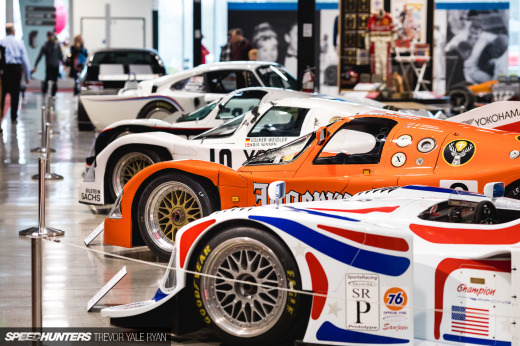 Most of the exhibits in the World Of Top Gear are listed as having an estimated value of £2.3 million, making this, as the man himself might say, one of the most prized and valuable collection of cars… in the world. lol ... in the world. LOL always a fan, thank you for the story Jonathan! Brilliant, and i watch it religiously when its on the bbc or on dave. 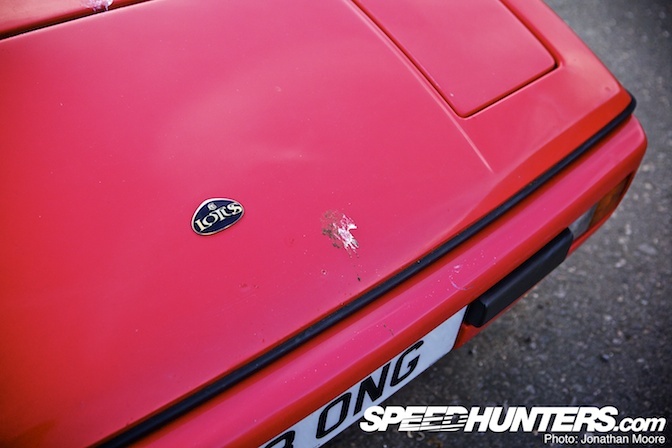 The Lotus from the motor home challenge belonged to James, not Hammond. Hammond had a Land Rover that turned into a house. This goes on my list of places to go lol ... love this show, but it doesn't seem like Mr. Moore does... hate to love and love to hate? Come on, you watch this show and these guys feel like family. You don't hate to love them. They love cars, we love cars, and I think they give most of there cars a fuller more recognized life then many owners ever will. Even if it's only for those 15 minutes of fame. Give the guys a break! Nice post, but that's a Z3, not a Z4. 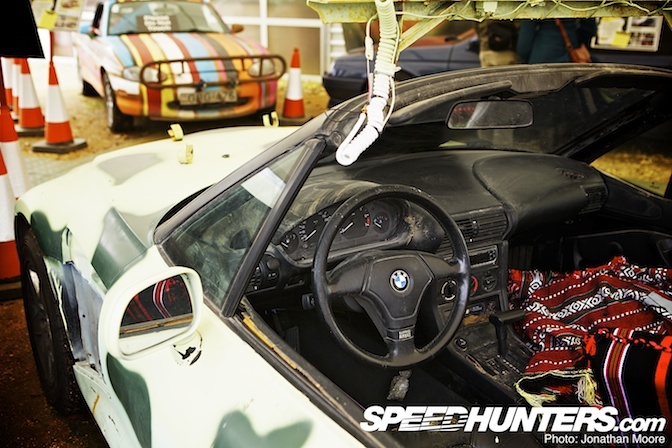 Ack, yes, of course it's a Z3  I've just got too used to typing Z4 with the GT3 car! And it must be my memory failing with the Lotus... My bad. The BMW isn't a Z4, but a Z3. But anyhow good feature. 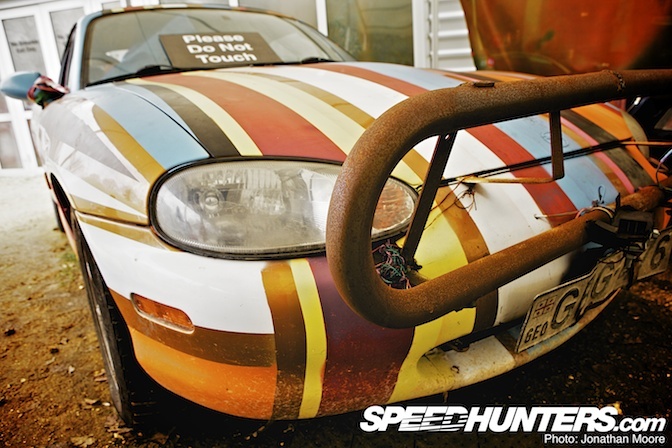 A die-hard fan of Top Gear here. Can't help but just look forward to each episode and each series, each year! 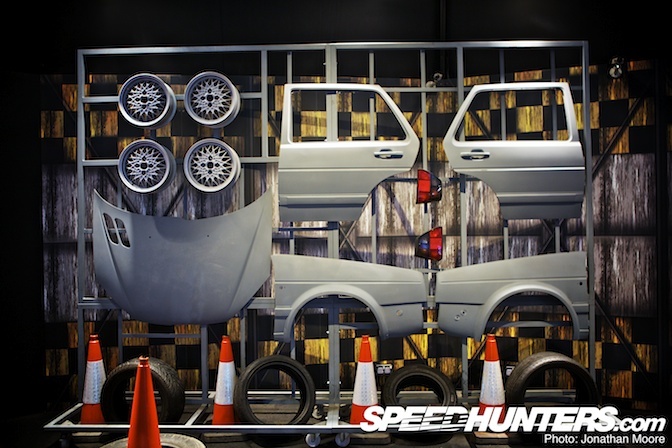 Thank you Jonathan for the coverage, and yes, I've known all the cars featured in this post very well. Why is there a peug 206 hood at the golf 2 fenders @ the model car kit? Fail! 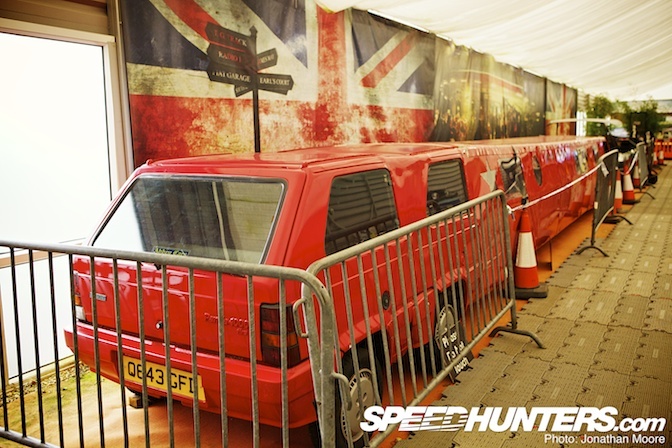 The Reliant Robin is remade version already ... the one that launched at the launch site have upside down Top Gear logo . i frickin love TOP GEAR, i think ive dvr'd every episode at least twice! i dont think any other program makes me quite as happy, repeat or no. Anybody know if Shumacher really was the stig for a while or was that scripted as well? who remembers that episode?! @TrickyTSX stig was never Shumacher, for the last few series, it has been F3 test drivers, and other young driving talents, the most publicised would be Ben Collins. didn't the Reliant get blown to bits on landing, so i assume that this one is a show remake? That was great! 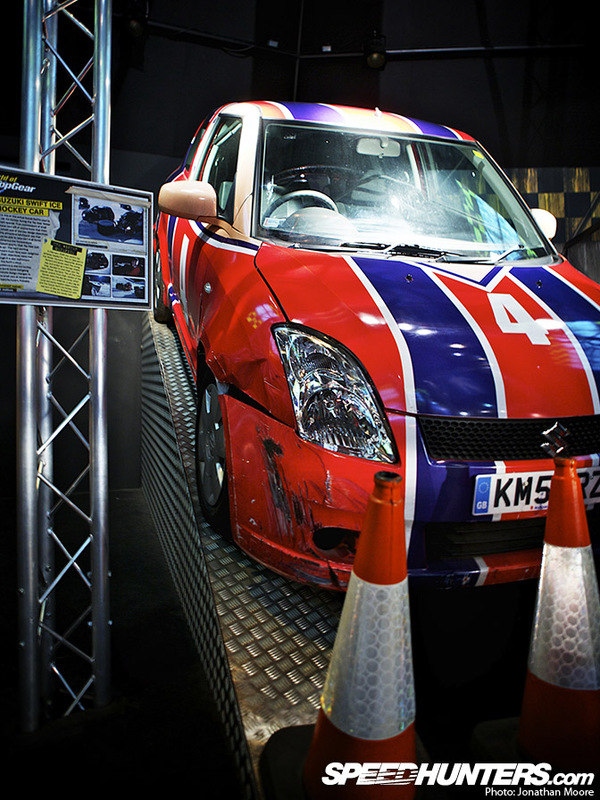 I never knew there was a Top Gear Museum. One day, when I go to England, this will be one of my stops! I went to Beaulieu last year, car collection not as big as I imagined, not really enough to keep you there more than a couple of hours but well worth going if you're in the area. Lovely part of the country down there too and an amazing Ferrari dealership at Lyndhurst which had nearly as much exotic stuff to look at including an Alfa 8C while I was there. 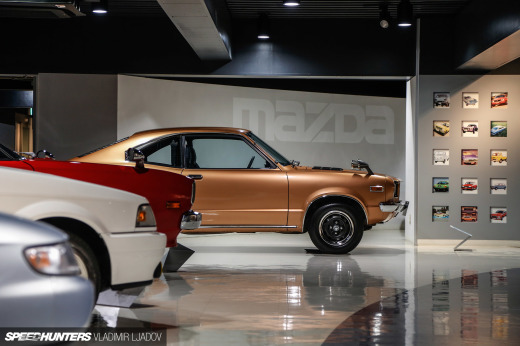 Now that's a Museum I wish to attend to someday... really like the show so am looking forward to attend there! Nice to see the Toyota from Top Gear's Iceland adventure is still around! We just wrote an article about Icelandic drivers...slightly satiric but all true. Hope you'll enjoy it!